What does it really take to know a city? More specifically, can you get to grips with a city by visiting a representative sample of it? Cinnabar Wright at The Phoenix in Burien, Washington. Needless to say, we were delayed. And is three restaurants, two Asian style gardens, a rose garden, a back yard and two days of continuous teas in seven different locations a representative sample? Our host claims to be “Portland’s Worst Tour Guide”, but the evidence says otherwise. Our party consists of Lady Devotea and myself, the oldest and most Canada-based of our offspring and his delightful Canadian partner, plus our great friend Julia from Bingley’s Teas, so it was always going to be worthwhile. And so this weekend was a restrained, sober, sombre and reflective tour of this city of half a million or so. 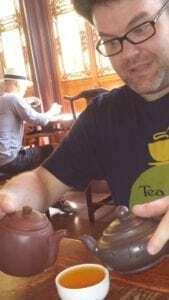 I should mention that our tour guide was the irrepressible tea blogger Geoffrey Norman, a man known for his quiet, sensible and thoughtful tea writings, but only in an alternate universe. In this one, he’s bonkers. In the best possible way, of course. 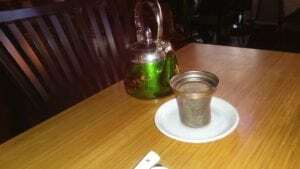 After being delayed by tea and chatter at Pheonix Tea in Burien, Washington, we rolled into Portland late and tired Friday. We had picked up Julia at the Pheonix and so the hours flew by as when she and Lady Devotea are in the same space it’s pretty well a party. But I’m not going to describe any of it in great detail, simply because you have to do it yourself. Go to Davisons in Tigard and have breakfast. You may need a wheelchair afterwards. 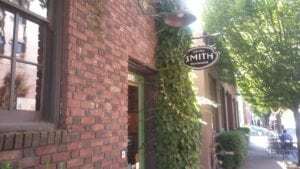 Go to Steven Smith teamakers and have tea. A lot of tea. I had a Nitro Masala Chai. Lady Devotea had the same – with cream. Then I had an iced ‘Fez’. Then I had an iced Caramel Darjeeling Latte. And a bunch of samples. And some other stuff. And much conversation with Jack, the owner’s son. And more samples. And the sheer pleasure of sitting at a tea bar counter and passing the time with great company. And we went to their other location for more the next day. And avoid the teab*gs. 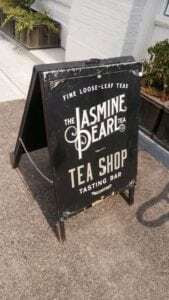 Go to the Jasmine Pearl and have tea. The Dancing Dragon Sarsparilla Iced Pu’er is amazing, amongst other things. I also tried a yellow tea that was pretty good. Go to the Chinese garden and have tea. And mooncake. Go to the Japanese Garden and have tea. OK, so the tea is not entirely to my taste, but you can console ourselves with mochi and anpan, which are two different ways to scoff sweet red bean. Visit Powell’s, the worlds biggest bookstore. While this is not specifically a tea experience, you can buy a bunch of books – we did- and then read them over tea – we have been. Eat at Dragonwell, a restaurant that is named after a type of tea. The food is excellent and the tea is more than passable. We had done everything on that list in one and three quarter days before getting to the home of Marilyn Miller, who had joined us for much of the above. Marilyn is a member of the NW WuWo society, a group that promotes the WuWo tea ceremony, and the group had invited us to their monthly get together, in fact holding it a week early to accommodate us. We arrived almost on time and were immediately charmed by a sleepy raccoon in the giant tree in the middle of the garden. Ah, the serenity. 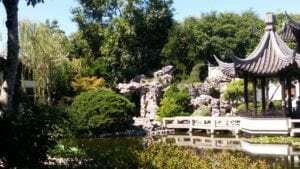 Chinese Garden in Portland, quite similar to the one in Sydney. Anyway, we eventually got to the WuWo ceremony and it was basically an outdoors tea sharing exercise carried out in total silence, which is OK in a backyard but not in the real outdoors, where “hey look, there’s a local carnivorous mammal heading your way” is often considered better manners than total silence. Everyone serves the three people to their left plus drinks whatever tea they had bought. So, the idea is that it is a less formal tea ceremony with flexible rules. All these things are relative, aren’t they? 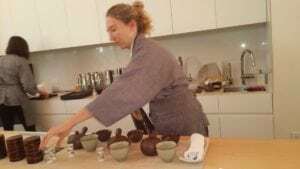 If your idea of a tea ceremony is some arcane practice steeped with ritual movements, staring at tea ware, contemplating your Jiko no jūyō-se and tea that has been incestuously intertwined with rice, then you might find it informal and flexible. 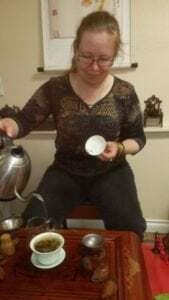 On the other hand, if your idea of a tea ceremony is a pint of Lady Devotea (the tea, not the person), several large cakes and giggling your giblets off with Lady Devotea (the person, not the tea) then you might find it quite formal. The tea we bought from Australia for this event was Hobo Lil. It was in a garden, so it seemed appropriate, and I have to say it really suited the event. Geoffrey loved it, which was just as well, as we had a box in our suitcase for him. Overall, I found it interesting and a worthwhile experience. 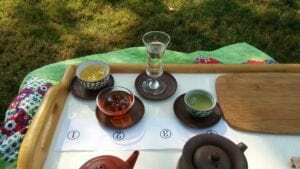 Sitting cross legged on the ground is not my thing, but arriving back to my station after dispensing tea was a bit of a thrill, as three cups of tea had mysteriously arrived on my tray. Of our party, two loved it, two didn’t and two were on the fence. It’s not for everyone but it is an experience I recommend at least once. Afterwards was some marionberry pie, which is a delicious local thing, and some of Marilyn’s own home grown tea, which more than stood up for itself. It was sad to take our leave of Portland the next morning. 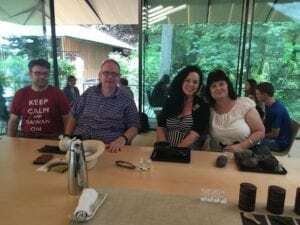 Living on the other side of the world, we don’t often see our tea friends, and they are always great company. Nevertheless, after pausing for another huge American breakfast at Davidson’s, we headed North to further adventure. Wasn’t sure if I was interested in this, but actually unmissable. The food was shiny, the service was shiny, and the metal teapot was shiny at Dragon Well. 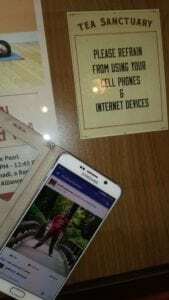 A sign that Geoffrey Norman completely ignored. And he wasn’t the only one, as this was taken on my phone.